The stoic philosopher Cleanthes, 333—231 BC? Marble. Roman copy ca. 100 CE after a Greek original of the 3rd century BCE. The portrait depicts the philosopher Zenon’s first student and successor, Cleanthes (333—231 B.C.). 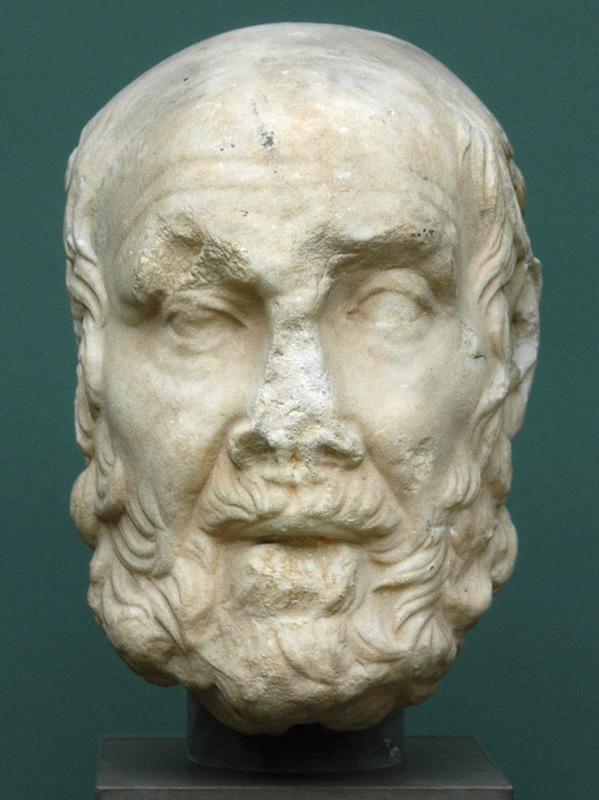 Thuri Lorenz has suggested that this portrait type, previously thought to be a representation of Hippocrates, might more correctly be identified as Cleanthes. Original: 3rd cent. B.C. Copy: C. 100 AD. Marble. H. — 0.26 m.
The greater part of the nose is missing. The eyebrows, the area around the mouth and the right ear have suffered some degree of damage. The back of the head has been broken off and is missing. Acquired in 1900 by Arndt. © 1992. Description: F. Johansen. Catalogue Greek portraits. Ny Carlsberg Glyptotek, 1992, p. 122, cat. no. 50.